Geese have to top of my list as being the most economical poultry on smallholdings or even when kept in the garden when space allows a reasonable amount of good quality grazing so I thought it would be a good idea to write a beginner’s guide to keeping geese for people wondering whether geese are right for them, or would like to take the plunge and start keeping geese. Firstly, the majority of a goose’s diet is grass. As a general rule of thumb, a quarter of an acre of grass (a reasonably sized lawn in most gardens) would be sufficient to provide a pair of geese with enough grass through the year, although most people also feed wheat these days which can top up a goose’s diet. It’s important to remember that winter grass doesn’t have the same quality as grass growing in the spring. Geese don’t generally fall ill if they are kept correctly, (they don’t suffer from red mite like chickens thank goodness) so other than routine worming, don’t require much in the way of medication. Geese don’t require expensive accommodation with nest boxes or perches built-in (an old shed will do, providing it has ventilation) and finally (the best part I think) is that they won’t turn a patch of grass into mud when it rains heavily like ducks will as they dabble. Droppings (which are basically macerated grass) do not smell and wash away easily in the rain or with the hose pipe. They can be used to keep grass short (see Grass Control with Geese), can put off and/or alert you to burglars or Mr. Fox lurking near your poultry and (if you are this way inclined), provide a delicious meat for the table. Geese are intelligent and I have found them particularly inquisitive. They will always come over to inspect what I am doing in the orchard, giving my pockets a nibble to check for bread before going about their grass cutting business. An orchard is really the perfect place to keep geese (and other poultry for that matter) since they need shade during the summer months and the grass they feed on will grow well with some dappled shade. Unfortunately geese will strip young fruit trees of their bark so you’ll need to protect trunks but they will do a good job of clearing windfalls as well as keeping the grass trimmed. Geese have earned a fierce reputation, however with gentle handling from young and hand feeding, they can be very tame. Keeping domestic geese certainly isn’t for everyone though. 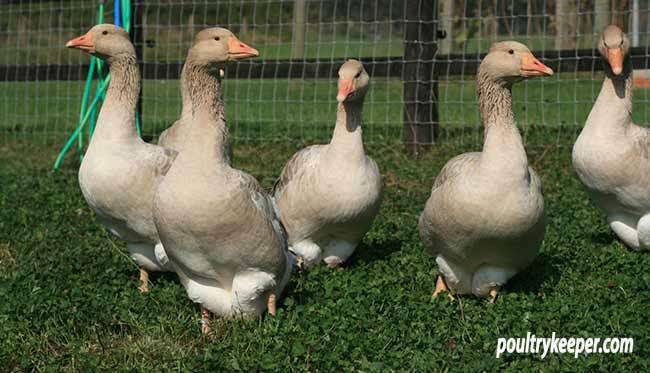 If you are considering getting some geese, there are a number of considerations that need to be taken before you bring geese home. Noise: Ganders can make a lot of noise, especially during the breeding season. The Chinese goose is by far the noisiest but ANY gander can disturb near neighbours so you may need to take this into consideration when deciding whether keeping geese is for you. Commitment: Geese can live for 20 years… they are a long-term commitment. Children: Children should never be left unsupervised with Geese and in general, up to the age of 7 years old make too many fast movements and make too much noise, upsetting geese. We kept geese in our garden but our friendly gander would soon chase a loud child running across the lawn, wings outstretched. Enough to put a child off for life. 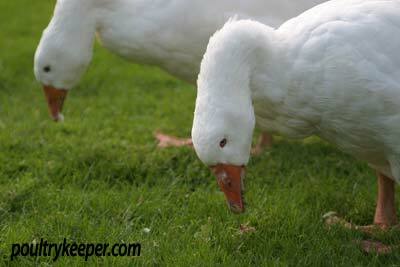 Grass: Grasses and clover makes up the majority of a goose’s diet. Not all grass is equal though and the protein levels vary between the different kinds of grass. Short, fresh, sweet grass is preferred and has the most nutritional content. Geese can keep grass in good condition for you, long grass must be cut first either by mower (8cm or less), or by using sheep or cattle to reduce the length. Ensure that you will be able to maintain sufficient grass (a lawn or orchard is ideal) for the number of geese you plan to keep and if you are keeping geese mainly on grass, they will need access to it throughout the day in order to have sufficient time to obtain enough nutrition. Security: Geese need a secure, predator proof enclosure. A gander however fierce is no match for a fox or stray dog. For larger areas, a fence with added electric fence wires on the outside is a good choice. There is some more information about fencing below and some examples are shown on the Poultry Fencing page on this site together with a number of other ideas on how to keep your birds secure. Water: Domestic geese do not need a pond (they only spend around 10% of their time on water) and a plastic tub or child’s sand pit tub is sufficient for them to be content. Geese prefer to mate on water so to ensure the heavier breeds (such as the African Goose or Toulouse) are successful with this, they may need slightly deeper water than the lighter weight breeds. 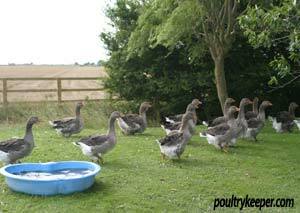 My flock of Brecon Buff Geese. A single pair of geese can be kept in a shed that has an area of around 1.7m2. This means a shed that is 1m (3.5ft) by 1.4M (4.5ft) shed would be sufficient for a pair. A small garden shed of 1.3m (4ft) by 1.8m (6ft) would be big enough to keep 4-5 geese in. Geese will not put themselves to bed at night but once they know the night-time routine, can easily be herded into their house with outstretched arms. Housing must be secure against the predators. The main one is the fox of course but badgers will also kill geese. Badgers are very strong and capable of tearing at planks of wood on poultry houses or weak areas of fencing. The safest way to keep foxes and badgers away at night is to locate the goose house inside a protected / fenced area. Polecats, Stoats, Weasels, Mink and Rats can all cause problems, especially to goslings and will squeeze through small holes so ensure ventilation holes are covered with a sturdy mesh. If you have a secure area (a proven electric fence for example), you can leave geese and other waterfowl out at night. Waterfowl, unlike chickens and other poultry are active at night and can see reasonably well in the dark. Keep in mind that they may make a great deal of noise if they spot something unusual and when it’s quiet at night, this noise can travel some distance, potentially disturbing neighbours. Secure poultry fencing is the only big investment you will need to make when keeping geese. I have tried a number of solutions and found that for large areas, it is better to use electric wires on the outside of the fence in order to deter climbers (such as mink, stoats or rats) and larger more common predators such as foxes and badgers that will also try to dig under a fence, especially on soft, sandy soils. The ideal solution would be a tall (say 1.8m) fence with an outward slope on the top and 30cm buried at the bottom. The mesh size would be too small for smaller predators to squeeze through and thick enough to prevent badgers or foxes from tearing it. An electric wire would run at low-level to prevent digging and close to the fence at the top to stop climbers from running over the top of the fence. The reality is this solution is very expensive to have installed, especially over a large area and a compromise must be found. I have used 1.3m fencing with electric wires on the outside successful. There is a dedicated page on poultry fencing which shows a number of fencing examples for poultry, including fences that can be used over larger areas for orchards or fields. In the wild, geese eat fresh grass and other shoots, however they do not lay many eggs and may not lay at all if food is scarce. 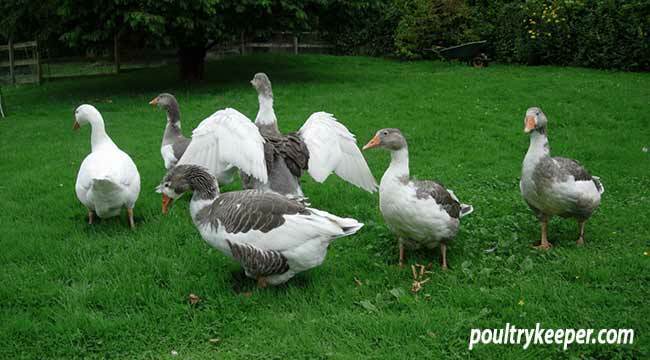 Domestic geese have a larger size to maintain and cannot survive on grass alone. During the summer months, if they have an extensive range, they may eat little else but grass, but during the autumn and winter months when the protein content of grass is lower, they will need wheat and pellets. 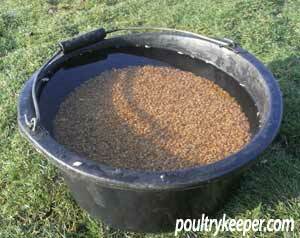 Place their wheat (up to 200g per day in winter) into water. This softens the wheat, making it easier to digest and stops crows and other birds from coming and having a free meal and potentially bringing in disease. I keep dry pellets in a wide rimmed hopper with a rain hat, but most keepers will place pellets and some dry wheat, mixed into a bowl, providing them with enough to eat in one feed each day. Layers mash isn’t suitable for geese because mixed with water, it can get stuck on the inside of their bills so it is best avoided. Always ensure there is drinking water available near their food. A bucket full of fresh water is ideal. 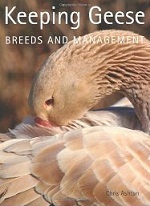 Keeping Geese: Breeds and Management by Chris Ashton. For further reading and as THE reference book to have on the shelf, I can highly recommend Chris Ashton’s book. This covers absolutely everything you’ll ever need to know about keeping geese. I had ‘Domestic Geese’ by the same author before this (which is also very good) but this book is more up to date and very well presented. I wouldn’t be without it on my book shelf.